kevin.fonner.net - A chronicle of technology and magic! I have been a developer for 14 years programming in Java, Groovy, Python, C#, C and several other languages. I currently work for The Babcock and Wilcox Corporation where I develop boring Enterprise Technology, specifically creating and managing customizations to a large proprietary J2EE application. In my spare time however, I work on all sorts of projects using many technologies from writing C for AVR microcontrollers to Java web based applications for automating my home. This blog is a way for me to show off my projects and how I built them. This is my latest Google Sketchup model for my Land project. The model is completely to scale and represents exactly the shape that I want. Well, almost. The slope of the roof is currently just estimated and I’m not sure if I want to go with something more intentional. 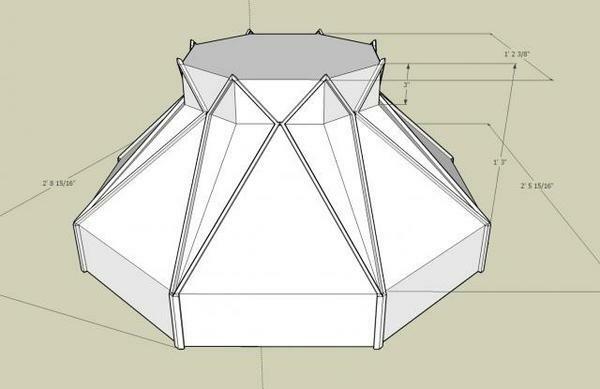 If anyone just happens to know the value of the slope of the the roof on the The Land pavilion at EPCOT Center, let me know.